To give you that little extra happiness in life, we are offering all new OCBC Booster Account holders an additional 0.25% p.a. 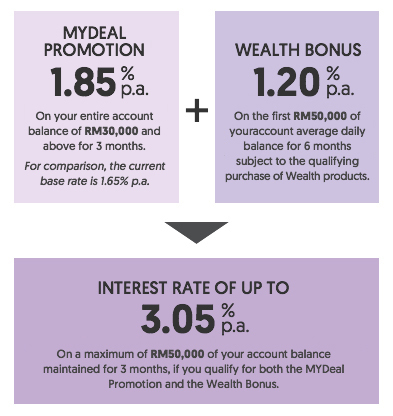 on your savings in our MYDeal Promotion when you maintain an account balance1 of at least RM30,000. Sign up today and give your savings a boost when you combine it with your wealth bonus. As an example, if you open a new OCBC Booster Account, maintain an account balance1 of RM30,000 from the time of opening and qualify for the 12-month Wealth Bonus, the Effective Interest Rate for 6 months is 4.70% p.a., and the Effective Interest Rate for 12 months is 4.58% p.a. Alternatively, you may invest in Unit Trust monthly investment to enjoy the wealth bonus of 1.20% p.a. on the first RM50,000 of your account balance for the number of month(s) that you invest at least RM1,500. Note: To ensure that the product you purchase meets your financial needs, our Personal Financial Consultant will perform a Financial Needs Analysis with you in order to help you make an informed decision. The wealth bonus is accorded for 12 months after either (i) the free look/cancellation period ends; or (ii) 14 days after the effective date of purchase, whichever is later. Effective date refers to the inception date of the insurance product and trade date of unit trust. The wealth bonus will be paid on the first RM50,000 of your account's average daily balance. You will receive it by the 14th business day of the following month. Minimum sales charge for eligible unit trust investments is 2.5%. The wealth bonus and the 2 MEPS withdrawal fee waiver are promotional and valid until 31 December 2019. If you qualify for the wealth bonus more than once in the same month, you will enjoy the wealth bonus from the effective date of purchase of the latest eligible wealth product. You need to be the primary account holder of OCBC Booster Account as well as the policy owner of the eligible insurance product or primary account holder of the eligible investment product. Alternatively, you may invest in Unit Trust monthly investment to enjoy the wealth bonus of 1.20% p.a. for the number of month(s) that you invest at least RM1,500. If you are investing in unit trust via monthly investment, each month's investment will earn one month's worth of wealth bonus. 1 How different is the OCBC Booster Account from other savings account? The OCBC Booster Account is a savings account that rewards you with a high base interest rate when you maintain an account balance of RM30,000 and above. In addition, it rewards you with wealth bonus when you invest or insure with OCBC. 2 How is the interest calculated? a) Base interest: This interest is accrued daily based on your account's day-end balance and you will receive this at the end of the month. b) Wealth bonus: This interest is based on the first RM50,000 of your account's average daily balance and you will receive this by the 14th business day of the following month or earlier; truncated to 2 decimal places. No wealth bonus will be paid to your OCBC Booster Account if the total amount of bonus in such month is less than RM0.01. 3 What will happen when my account balance fall below RM30,000? The base interest of 0.25% p.a. will be accrued based on the days where your account balance falls below RM30,000. For example: If you have maintained your account balance below RM30,000 between the 1st - 15th of the month, then your base interest accrued for this account balance will be 0.25% p.a. from 1st - 15th of the month. Subsequently, if you maintain your account balance at or above RM30,000 between the 16th - 31st of the month, then your base interest accrued for this balance will be 3.25% p.a. from the 16th - 31st of the month. 1-15 January RM28,000 0.25% p.a. 16-31 January RM32,000 3.25% p.a. 4 Can I open more than one OCBC Booster Account? You may only open ONE OCBC Booster Account whether in own name or in joint names, where you are the primary account holder. 5 Can I use the money in my OCBC Booster Account? Yes, you can. There is no lock-in period for this account. You can withdraw money with a debit card and/or access your money through OCBC Online Banking. 6 Where can I withdraw money from my OCBC Booster Account? You can withdraw money from any ATM operated by OCBC Group, comprising of OCBC Bank in Malaysia & Singapore, OCBC Al-Amin Bank, OCBC NISP (Indonesia) and OCBC Wing Hang (Hong Kong and Macau) at no charges. You can also withdraw from any ATM within the MEPS network where your MEPS fee for the first 2 withdrawals of each month will be waived. Subsequent withdrawals will be charged at up to RM4.00 per withdrawal. 1 How do I qualify for the wealth bonus? You need to invest in any eligible wealth product of at least the minimum amount with OCBC Bank. Only purchases made after 1 April 2018 will be eligible. 2 When will I receive the wealth bonus? This wealth bonus is accorded for 12 months. Payment starts after the month in which either (i) the free look/cancellation period ends; or (ii) 14 days have passed after the effective date of purchase, whichever is later. Effective date of purchase refers to the inception date of the insurance product and trade date of unit trust. 3 How will I know that the base interest is credited to my OCBC Booster Account? Your base interest will be reflected in your statement, Online Banking and Mobile Banking transaction history as INTEREST CREDIT. 4 How will I know that the wealth bonus is credited to my OCBC Booster Account? Your wealth bonus will be reflected in your statement, Online Banking and Mobile Banking transaction history as WEALTH BONUS. If you close your account before the wealth bonus crediting date, the wealth bonus for the previous month will be forfeited. 5 How will my wealth bonus be accounted for if I have more than RM50,000 in my account balance? You will continue to enjoy your wealth bonus of 1.20% p.a. on the first RM50,000 of your OCBC Booster Account's average daily balance. Additionally, you will still earn the base interest of 3.25% p.a. on your entire account balance. 6 Can I combine the multiple wealth product purchases I made to qualify for the wealth bonus? Yes, you can. Purchases of the same wealth product meeting the minimum eligibility criteria can be accumulated if their effective date of purchase, after the free look/ cancellation period or 14 days whichever is later, falls in the same calendar month. 7 What happens if I qualify for the wealth bonus more than once and the respective 12-month bonus periods overlap? For months which there are overlaps, you will enjoy the maximum wealth bonus of 1.20% p.a. from the effective date of purchase of the latest eligible wealth product. 8 Will my wealth bonus period get renewed when I pay for subsequent regular premiums? For eligible wealth products with regular premium, only the first year annual premium is eligible. Any subsequent premium payment will not be eligible. 9 How long can I enjoy the wealth bonus for if I qualify for it? Unit Trust monthly investment For as long as you make your monthly investments up until the end of the promotional period on 31 December 2019. 10 Do I continue to get this wealth bonus if I redeem my investments or when they mature? Yes. You will continue to get this wealth bonus. 11 Do I continue to get this wealth bonus if I cancel my investment and/or policy during the free look/cancellation period? No, you will not be eligible for the wealth bonus. The wealth bonus is accorded for only after the effective date of purchase, after the free look/cancellation period or 14 days, whichever is later. 12 How can I pay for the eligible wealth products? 13 Where can I find more information on the eligible wealth products? Alternatively, please leave your contact details herehere and we will get in touch with you. 14 What are the financial products excluded from wealth bonus? for us to meet up and better assist you. State Johor Kedah Kelantan Kuala Lumpur Melaka Negeri Sembilan Pahang Perak Pulau Pinang Selangor This field is required. State Johor Kedah Kelantan Kuala Lumpur Melaka Negeri Sembilan Pahang Perak Pulau Pinang Sabah Sarawak Selangor This field is required. Branch Location This field is required. Declaration and Agreement Please tick the checkbox in order to proceed. Your preferred area* Alor Setar Ampang Balakong Batu Maung Batu Pahat Bukit Mertajam Cheras Damansara Ijok Ipoh Johor Bahru Kajang Kepong Klang Kluang Kota Bharu Kota Damansara Kota Kemuning Kuala Lumpur Main Kuantan Kulai Melaka Melawati Muar Penang Petaling Jaya Puchong Rawang Segamat Seremban Skudai Subang Jaya Taiping Taman Molek Teluk Intan Wangsa Maju This field is required. The amount is calculated on per month (31 days) basis and is for illustration purposes only. ¹Base interest per month is calculated based on account daily balance and will be paid on monthly basis. ²Wealth bonus per month is calculated based on account average balance and will be paid on monthly basis. Alternatively, you may invest in Unit Trust monthly investment to enjoy the wealth bonus of 1.2% p.a. for the number of month(s) that you invest at least RM1,500. 1The base rate is calculated on your OCBC Booster Account day-end account balance whereas Wealth Bonus is calculated on the OCBC Booster Account average daily balance. The MYDeal Promotion is for new OCBC Booster Accounts opened from 1 April until 30 June 2019. If you maintain an account balance of RM30,000 or above from the date of account opening, you will enjoy a promotional rate of 3.50% p.a. for 6 months from the date of the account opening; thereafter, the promotional rate will cease and you will receive the current interest rate of 3.25% p.a.. This promotion is not valid for account balances of below RM30,000. If you have purchased an OCBC Bank wealth product that qualifies you for the Wealth Bonus upon opening of the OCBC Booster Account, you will also enjoy a bonus interest of 1.20% p.a. for 12 months. The Wealth Bonus is a separate promotion and valid until 31 December 2019. Only selected products are eligible for Wealth Bonus. ● Deposit protection is automatic. ● PIDM protects depositors holding deposits with banks. ● There is no charge to depositors for deposit insurance protection. ● Should a bank fail, PIDM will promptly reimburse depositors over their deposits. The above is for general information only and does not constitute any offer or solicitation or advice to buy or sell any insurance plans. It is not a contract of insurance. The precise terms, conditions and definitions of this insurance plan are specified in the policy contract. Insurance plans are not bank deposits and are not obligations of or guaranteed or insured by OCBC Bank (Malaysia) Berhad. These insurance products are obligations only of the insurance company and all claims and liabilities arising from the insurance products shall be referred to insurance company. Buying a life insurance policy is a long-term commitment. An early termination of the policy usually involves high costs and surrender value payable may be less than the total premium paid. You should read the Product Brochure and Sales Illustration (obtainable from OCBC Bank) and you may wish to seek advice from your financial advisor, before deciding whether to buy this product. OCBC Bank hereby disclaims any liability for any loss or damage (including without limitation, loss of income, profits or goodwill, direct or indirect, incidental, consequential, exemplary, punitive or special damages of any party including third parties) howsoever arising whether in contract, tort, negligence or otherwise in connection with the above plan or any products or services provided or offered by insurance company. OCBC Bank does not endorse or recommend any products or services offered, or represent or verify any information given by insurance company. Other terms and conditions apply. For the full terms and conditions, please refer to any OCBC Bank branches. This is for information only and does not constitute any offer, solicitation or advice to buy or sell unit trust funds. Please make your own independent evaluation of the suitability of the product and obtain advice from professional advisers including on tax, accounting and legal matters. We will not be responsible for the consequences of your reliance upon any opinion or statement contained herein or for any omission. These unit trusts are not bank deposits and are not obligations of or guaranteed or insured by OCBC Bank and are subject to investment risk unless otherwise specified. The investment risk includes general risks and specific risks as described in the Prospectus for the unit trust. Past performance is not indicative of future performance; the net asset value can go up or down. Investors should also note that the net asset value per unit and distributions payable, if any, may go down as well as up. The Prospectus has been registered with the Securities Commission, which takes no responsibility for its content. A copy of the Prospectus can be obtained at OCBC Bank's branches. Units will only be issued upon the receipt of application form referred to and accompanying the Prospectus. Investors are advised to read and understand the contents of the Prospectus, and if necessary consult their adviser(s), as well as consider the fees and charges involved before investing in the unit trusts.